I recently caught a fantastic performance by Emerald Rose at the Variety Playhouse in Atlanta, Georgia in October of 2000. My review was printed in the Celtic Café and I have reprinted it for EAR CANDY. With the opening of their first song, I knew that I was in store for a "new" Emerald Rose. Last night's gig was a Samhain celebration and the band entered in robes, lit only from two jack-o-lanterns on the stage. Starting into "The Pict Song", their mysterious, theatrical ambiance only made the semi-historical Rudyard Kipling story more mesmerizing. The second song, a set of jigs, featured "Madman" Larry Morris and his amazing penny whistle. Larry played "wireless" and seemed more at ease than previous gigs where he had to stay stuck to the microphone. By their third song, "Fire in the Head", they had the audience on their feet; and they stayed on their feet for just about the entire show. For those not familiar with Emerald Rose, let me give a quick background. Formed in 1997, the band has released two CD's and built a grass roots following in North Georgia. Much more than your average Celtic band, Emerald Rose is self-described as "Celtic-folk-pagan-pop-fusion". It is this intertwining of themes that makes the band so interesting. My last visit to Napster I was surprised to find a few Emerald Rose bootleg tracks. Now that's the sign of a band with a following. Whether it is subtle, pagan-theme songs, traditional Celtic tunes or classic rock tunes with a Celtic twist, Emerald Rose has formed a sound, which is distinctly theirs. An example of this was the next song they performed, "Lucky Man" by Emerson, Lake and Palmer. They turn this indulgent, art-rock song of the 70's into fresh sounding, harmony-laden song with a Celtic twist. Arthur Hinds even joked before the song, "it wasn't a Celtic song, but it should be!" Next was the traditional Irish song, "Red-Haired Mary", complete with a funny intro by Brian Sullivan. Speaking of which, Emerald Rose has turned into a finely tuned, professional band in the last few years that I've seen them. They are now totally at ease on stage and each member delivered a funny aside at one time or another during the show. 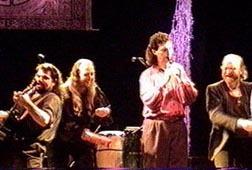 The band used to depend on humor-laden songs such as "Chicken Raid" and "My P.B.J" for chuckles, but now are genuinely funny in their stage banter. The band continued with the Hinds' original, "The World's Wedding", followed by another amazing jig featuring "Madman" Morris. Following the traditional "Maggie Lauder", the band dedicated their next song (the original, "Hill's of America") to their vocal coach who had recently died in a plane crash. It was the only somber moment of the show. After a short intermission, Emerald Rose returned with what they termed their "magickal" set. While the set concentrated on pagan-theme songs, they opened with the traditional "Johnnie Cope", following with the Arthur/Grail imagery of "Castle of Arianrhod". Then came one of my personal highlights of the evening: a jig in which the band pushed Larry Morris to see how fast he could play his penny whistle. Each section of the jig increased in speed to a feverish pitch. You could swear you saw fire coming from the "Madman's " whistle! The last six songs were Emerald Rose at their very best. Slowing it down a little with the excellent original, "Penny in the Well", the band then launched into an onslaught of their most popular songs, each bringing more and more people to dance in the "pagan mosh pit "! The final songs included: "Summerland", "Lord of the Dance", "Never Underestimate", "Pagan Girl" and "Donald McGillivray " for an excellent lesson in bringing an audience to the brink of frenzy. However, as Emerald Rose left the stage, the audience was too hyped- up and cheered for an encore. The final song of the evening, "Freya Shakti" could easily be the Emerald Rose theme song, as it evokes the essence of the band. Tonight I saw the next step of Emerald Rose's development. They conquered their first challenge, making the leap from a sonically deficient (but excellent material) first demo CD to the pristine, majesty of their excellent, second CD. I've been following the band for the last three years, and what I saw last night was full circle from their humble beginnings. While not many can make that leap from small pub performance settings to the large concert stage, the band delivered one of their finest performances to date. This despite some sound board problems. Emerald Rose is simply Celtic Diversity at its finest!